We’ve all been there, when that beloved gadget where you could once find the sweet spot has now gotta go; it’s too slow. Geeks want the next best and shiny new toy, the fastest hot new gadget on the market. But that toxic and outdated electronic equipment winds up in landfills to leach poisonous heavy metals into the soil and groundwater. Instead of leaving a technological footprint on the environment, let your inner eco-geek blossom. Here are 25 hardware hacks and magnificent manipulations of e-waste repurposed to functional geeky gadgets. Plenty of printed circuit boards are headed for processing to extract the precious metals before hitting the landfill. Before you throw it out, stop and think how to recycle obsolete parts into a functioning gadget for your favorite geek. These hardware hacks of circuitry and creativity are so slick that it might send you dumpster diving for discarded electronics. The desk clock on the left was repurposed from a 40 GB hard drive control board. 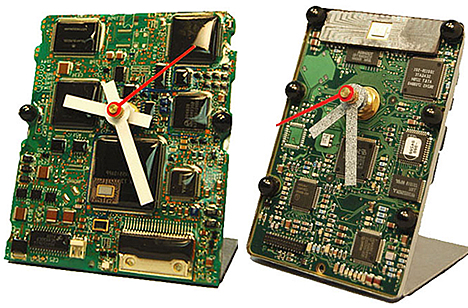 The clock on the right was recreated as a blend from a Circa 1990 laptop drive controller and from a 20 MB Seagate low-profile, high-speed, dual mode drive controller card. This example of blurred boundaries between one person’s trash being another’s treasure should be codenamed COOL. 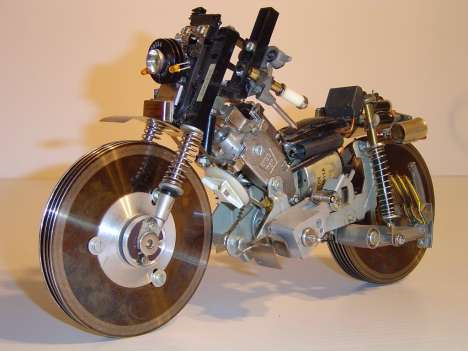 This futuristic motorcycle was crafted from recycled computer and VCR parts. The engine is an electric DC Motor to power a belt for the rear wheel drive, but was turned on for demonstration only. Maybe one eco-geek will soon figure out how to get this bad boy hitting the highway and cruising full speed into adventures. Time rules the world whether we want it to or not. Geeky gadgets around the globe include an eclectic collection of hard drive and floppy cases, RAM, processors, other chips and circuit boards. Some eco-geeks can turn discarded aerospace and military hardware into functioning sculptures and clocks. The top two wall clocks are made from a drive platter and a hard drive case. 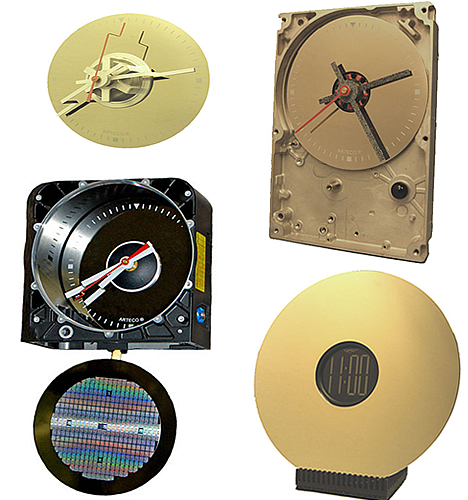 The pendulum wall clock on the bottom left was once a militarized hard drive shell, while the pendulum has a 4″ wafer with vapor deposition memory chips. On the bottom right, this desk clock was a drive platter with a heat sink stand from a Pentium processor chip. Reverse-engineering and disassembling technology are the building blocks of eco-geek beauty. The top left desk clock was recycled from a Pentium II processor with support chips. On the top right, this desk clock was repurposed from an office telephone PC board and is sitting on a heat sink from a Pentium processor chip. The bottom left wall clock was salvaged from the geek part graveyard and the injection molded aluminum case came from a 10 MB Maxtor drive with a platter in the center of the clock. 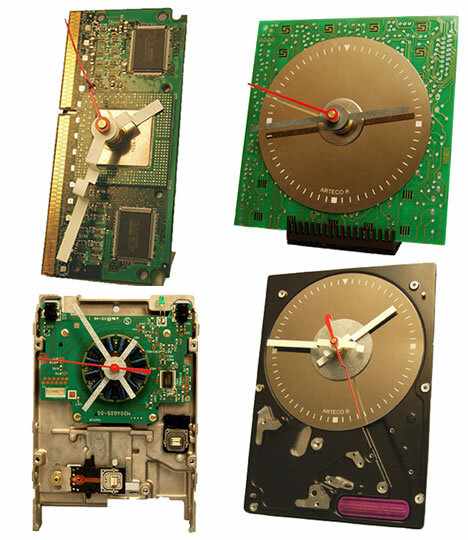 On the bottom right, this wall clock had a previous life functioning as a militarized Seagate hard drive frame. 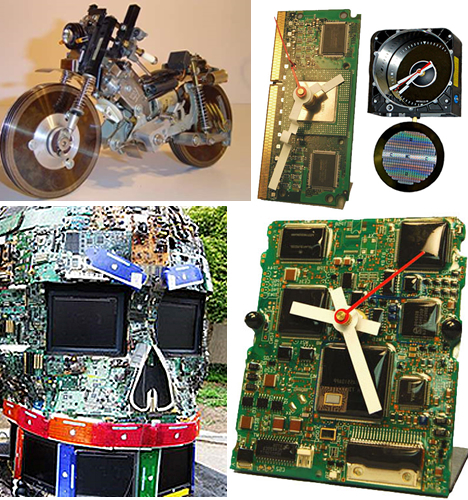 These creative initiatives focus on commissioning clunkers into clocks. 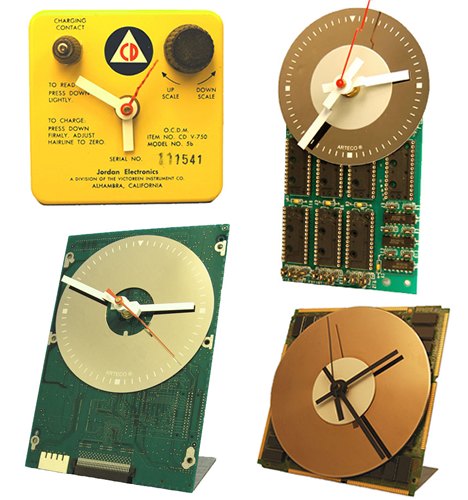 On the top left, this deep desk clock was built from a vintage Circa 1950 Civil Defense dosimeter reading device. What was once from a high-performance computer, now has been repurposed into other functions that were not what the chip-makers or manufacturers had in mind. Hardware hacks like the wall clock on the top right once functioned as an ATM firmware board with 28 pin gold sockets. On the bottom left, an 80 GB militarized hard drive board now works as a desk clock. The bottom right desk clock consists of a drive platter, recycled computer cabinets, and DRAM modules from an early IBM PC. 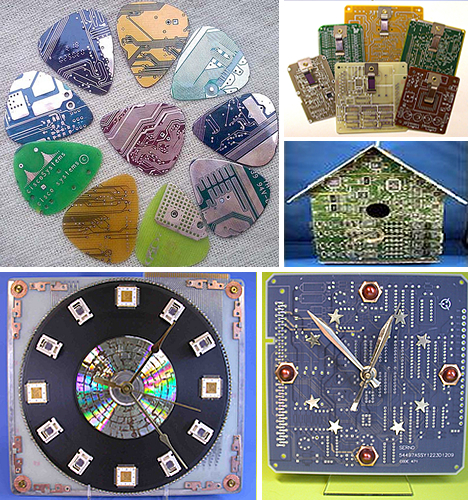 Geeks who jam came up with guitar picks made from circuit boards. But clipboards like circuit boards come in all colors and sizes. A creative eco-geek turned yet other circuit boards into a bird house. On the bottom left, this repurposed circuit board clock also has a recycled 78 RPM vinyl record and a recycled CD. On the bottom right, this rare all black recycled circuit board now functions as a clock with recycled brass. We geeks are everywhere and we hold the power and talent to change the world for the better. Ever wondered what else you could do with all those motherboards, hard drives, circuit boards and ROM that look cool but are headed for the trash? 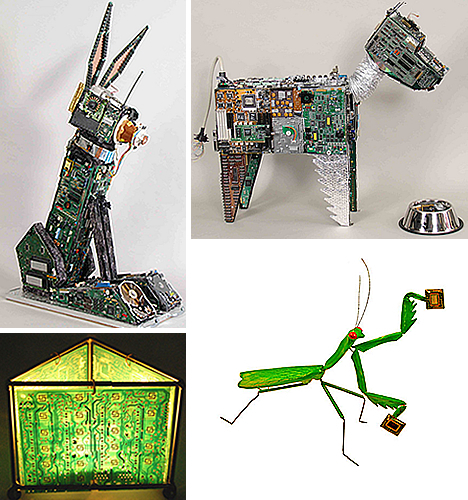 Some outdated or broken miscellaneous computer parts are made into awesome art animals like the 3.5 feet tall jack rabbit on the top left. Jack’s nose is made from a computer monitor coil, his toes from hard disk drives and his ears have copper sheeting. K-9 on the top right is 3 feet tall and repurposed from obsolete electronic guts that would otherwise be headed for the landfill. Yet for functioning art to show your geeky romantic side, why not turn the circuit boards from AT&T phones into a three-panel tea candle? On the bottom left, is a decorative Praying Mantis holding two cray memory chips. The legs can be gently moved. 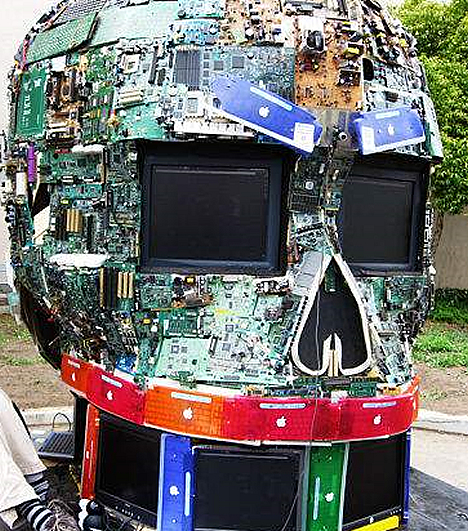 For a truly inspirational and green way of recycling parts, take a look at this huge skull. This fantastic art is recycled from obsolete and no longer useful computer screens and keyboards, circuit boards, and otherwise broken computer pieces. Such masterpieces mitigate the environmental damage of technology while offering a creative new approach to destroying data on old hard drives.